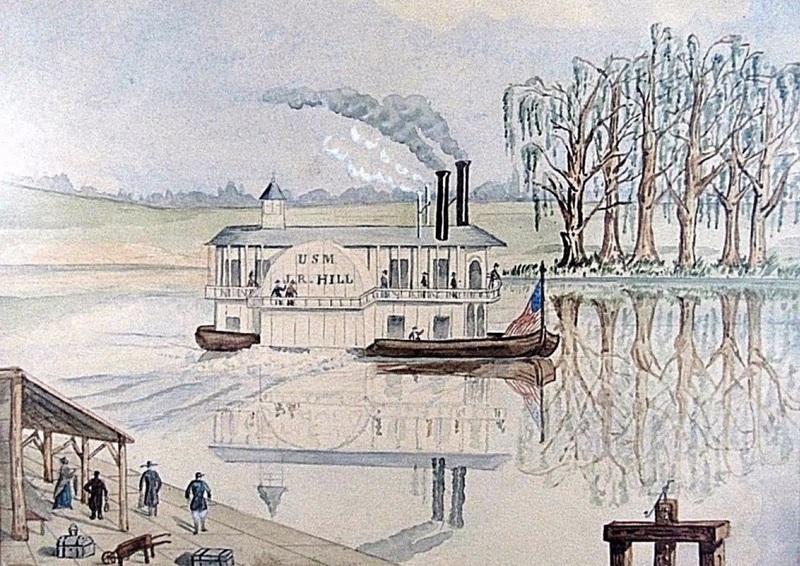 Unusual watercolor painted in 1850 of a steamboat without a pilot house. Suppose the boat could have possibly been steered from that small-windowed structure with a conical roof at the stern on the top deck; or the pilot may have steered the boat from just inside the front of the cabin on the boiler deck. A relatively small boat, this may have run on bayous in Louisiana. Fred Way doesn't have a listing for a boat with this name in his Packet Directory. We are pleased to present an American School watercolor and ink on paper 7 3/4" x 10-1/4" circa 1850 of a paddle-wheel steam-boat "USM, J. R. Hill." (USM maybe an acronym for U. S. Mail/Merchant). Overall dimensions are 19 7/8" x 17-3/4". Suspicions arise that the subject matter is probably Southern based on the types of trees which are predominant in the painting. The background suggests some rolling hills and elevations are present. The painting is free floating and housed in a hand wrapped linen mat with non-glare museum glass. It appears relatively free of foxing with an assessment of very good condition. The frame is antique and dates slightly earlier then watercolor. They are a nice-appropriate fit. Christy's appraisal in 2001 was for estate purposes with a value of $2,000. The Carolina Sternwheeler was an impressive paddle boat that docked in Plantation Square for the CAROWINDS theme park's during its first 30 years. Carowinds finally opened it's gates to the public on a rainy, March 31, 1973 at 9:36am. About 3,100 people passed through the turnstiles on that rainy, opening day, much less than the 25,000 anticipated. Fortunately, the first season ended with an impressive 1.2 million visitors, a record it held for a number of years when the impending oil crisis substantially hurt the travel and tourism industry. And amid the multiple park ownerships & personnel changes, come the inevitable and often drastic transformations that are necessary to remain fresh and competitive. The old Carowinds today, is barely recognizable with the exception of a few original rides and buildings. All of the down home, local charm that made Carowinds that special place it was back then, are long gone. Many of those who visited Carowinds in it's hey day may recall certain thrill rides like the Surfer, the Witchdoctor or White Lightnin'. Others will remember the exquisite Double-Decker, German-made carousel, the Carolina Sternwheeler, the Monorail or the 2 authentic Steam Engine trains. And others may simply remember the Cable Skyway, a spin on the Oaken Bucket or the trams that would take guests to the former Plantation House entrance. Another curiosity from R.V. 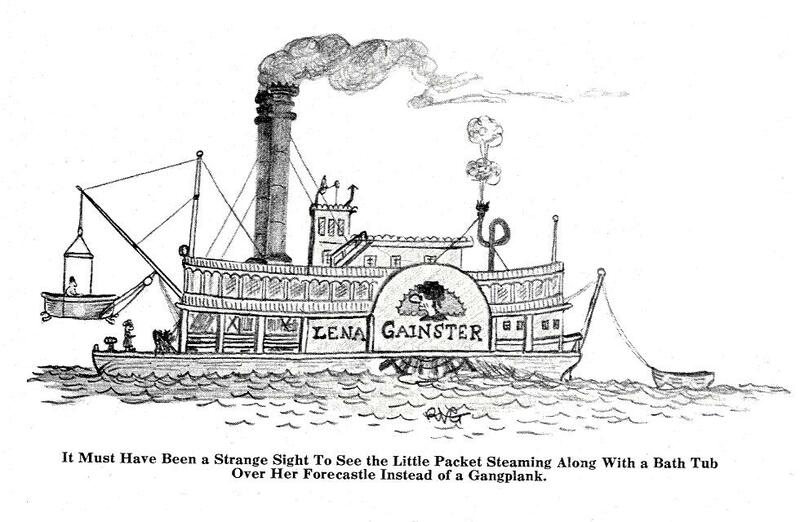 Gerber in prose along with a cartoon he drew of the steamboat LENA GAINSTER. Mrs. Captain Lena Gainster nonchalantly spat tobacco juice over the rail of the hurricane deck aboard the steamboat which bore her name, and with a ring of agony in her deep, gruff voice, spoke to the figure-head beside her, a small, thin, timid gentleman who was none other than her husband. "If this Depression keeps on," she grumbled, "I'm going to junk this mud scow and clear out!" That was many, many years ago, down on the verdant banks of the Suwannee River, so the story goes, and where it seems, there was a business depression that was so bad it makes our present hard times seem like a boom. The packet boat business on Suwannee River at that period had been hit so terrible that most of the steamboat owners were forced to dispose of all their land property and live on their boats. The first winter was so hard that these very men and their families could not afford to buy coal, and thus, while they lived in one part of their steamboat, they gradually dismantled other parts, using the wood for kindling, so that by the time summer arrived all that was left of the boat was the pilot house stove which had consumed the rest of the craft during the cold weather. Mrs. Captain Lena Gainster's staunch namesake was one of the few packet boats left on that river in the spring of 1832, and with her husband as chief engineer, she was trying her best to eke out a living in the clothes prop trade which had once been flourishing. But now people were not washing their clothes, since their clothes were worn out and they had no money to buy new ones. No wonder, then, that Mrs. Captain Lena Gainster was worried as well as angry as she paced up and down the hurricane deck, while her husband, unaffected by Depressions or anything else, fell asleep and snored contentedly in the warm summer sun. One day, to add insult to injury, one of the greatest floods in the history of the Suwannee River destroyed everything that the Depression had not already ruined, and while on her last trip in the clothes prop trade, a most extraordinary thing happened to Mrs. Captain Lena Gainster and her husband, which gentleman was, at the time, on one of his many vacations. It seems that the speedy little side wheel packet was coming up stream battling the flooded waters with Mrs. Captain Lena Gainster at the wheel, when the woman-Captain suddenly spied her house floating down the river, and heard her husband's voice inside calling for help. "Why doesn't the idiot get out on the roof?" she thought as she pulled up along side the floating house and sent some roustabouts in through a second story window after her husband. The roustabouts reported that the reason the gentleman was not on the roof was because he had been taking a bath when the river suddenly carried the house away and left him helplessly stranded in the tub with all clothing and other means of covering gone. There was only one way to save her husband. He must be extracted from the house, tub and all. Quickly Mrs. Captain Lena Gainster ordered the stage lowered onto the forecastle of the packet and uncoupled from the boom. Meanwhile other roustabouts were chopping a large hole in the roof of the house with fire axes. The boom and rigging were then hoisted over and the rigging lowered through the hole in the roof, where it was made fast to the bath tub inside the house. A few seconds later the derrick hoisted bath tub and chief engineer out of the rapidly sinking dwelling, and it must have been a strange sight to see the little packet steaming along with a bath tub hanging over her forecastle instead of a gangplank. Upon the loss of her property Mrs. Captain Lena Gainster found herself bankrupt. Her patience exhausted, and in a fit of anger, the woman navigator suddenly decided to turn river bandit. As the story goes, she ran her packet up to the headwaters of the Suwannee River in the Okeefenokee Swamp in Georgia, tied it up, and left her husband to watch it until she returned. "When I come back," she told him gruffly, "I'll have more treasures than Captain Kidd ever saw in his time. And another thing!" she added, shaking her large finger in the little man's sleepy face, "don't let any one come aboard this packet, because I intend to conceal all the treasure I get in the hull until I'm ready to steam this mud scow back to town with it." And thus the little packet LENA GAINSTER came to be known as the "Ghost Ship." For years she creaked and groaned at her moorings in the dismal swamp. Curious townspeople who ventured within sight of her, looked at her with fear in their hearts, and if the slightest breeze caused even so much as a shutter to slam on the boat and break the solitude of the lonely swamp, these persons would take to their heels like frightened rabbits. Some of the more daring, however, came back with stories that, if at night you got close enough to the packet you could her her 'scape pipes breathing softly in the night air as if the boat was impatiently waiting for its lady-Captain to return and run it back to town with its vast treasure. Finally, an exceptionally brave chap who went aboard the boat late one night, explained that the breathing of the 'scape pipes had been mistaken for the irregular breathing of Mrs. Captain Lena Gainster's husband who had developed asthma. This chap told also that the engines of the little packet were freshly oiled and in readiness to transport the large treasure chests which the lady-Captain and bandit was housing in the spidery, bat-infested hull of the steamboat. After she had left her husband to watch the little packet in the swamp, Mrs. Captain Lena Gainster, the lady bandit, stole a motor boat and barge and proceeded down the river. At night she would pull up beside a landed steamboat whose crew were asleep, and dismantle as much of the boat as was possible, loading the material on the barge. In this manner she finally got together enough material off of different boats to build her own packet, and this she did, naming the boat MISS FORTUNE after the Depression which was still on. She then proceeded to tour up and down the Suwannee River in the MISS FORTUNE, robbing and plundering other boats and people, and hiding the loot in the hull of the LENA GAINSTER. Her method of plundering was most unusual. She would anchor the MISS FORTUNE in a shadowy cove of the river and wait for an approaching steamboat. As it neared the cove the woman bandit would lasso the unsuspected packet and pull the boat into the cove with the capstan of her own steamer before the surprised officers on watch could cut or break their boat loose from the line. Then, with the packet pulled into the cove, and with its officers and bewildered passengers held powerless at the point of a cannon from the deck of the "Miss Fortune," the woman bandit would help herself to the captured boat's possessions. For many years Mrs. Captain Lena Gainster, the river bandit, indulged in this unlawful procedure until the old hull of the packet in the swamp was loaded to the guards with stolen treasure. Satisfied at length with what she had plundered, she decided to return to the LENA GAINSTER, run the boat back to its former port, repair it, and re-enter the clothes prop trade. She therefore deserted the "Miss Fortune"—her pirate ship—setting fire to it. And thus, after many years of idleness, the little packet of the swamp got up steam and proceeded down the river. People who never believed in ghosts before did when they saw this long-forgotten packet come back as if from the grave. With Mrs. Captain Lena Gainster, now ex-bandit, at the wheel, and her husband at the throttle in the engine room, the heavily ladened steamboat returned to her long-deserted port. 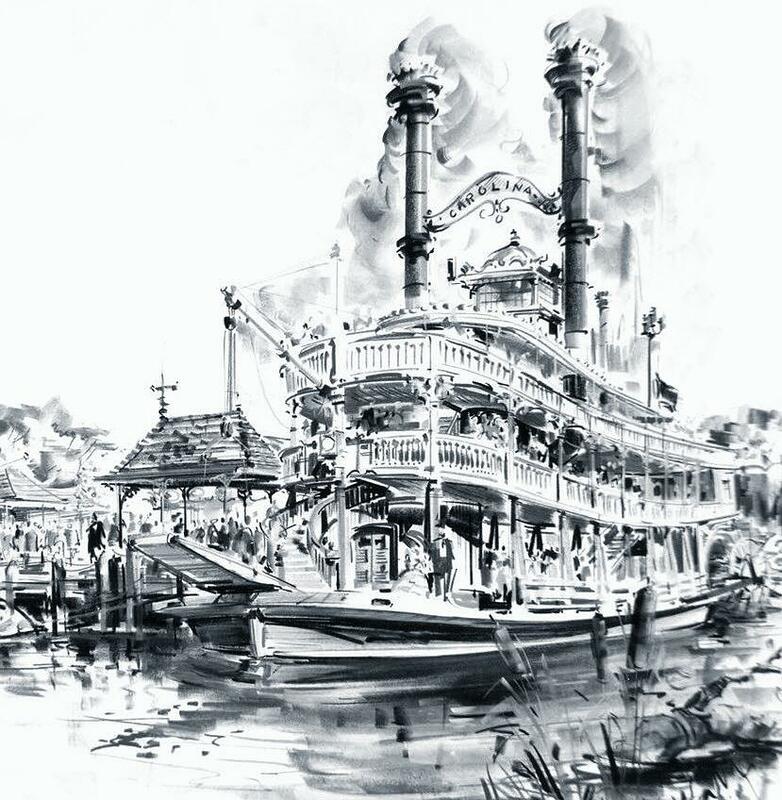 Unfortunately, however, before the little steamboat landed, disaster overtook her, carrying her and her vast treasure to the bottom of the Suwannee River at its deepest point, a spot that never measured less than twenty-four feet in depth. It seems that the boat ran around on a herd of submerged alligators at this spot, ripping open a large portion of her rotten hull on their tough hides. Due to the fact that Mrs. Captain Lena Gainster's husband had fallen asleep at the throttle in the engine room, it was impossible to maneuver the disabled packet in any satisfactory way, and burdened with her heavy treasure chests, the boat sank in sixty seconds, carrying with her the woman skipper and the sleeping engineer. All of which brings out the truth of that poetic phrase: "Cursed be the gold that gilds the straiten'd forehead of the fool!" At any rate the treasure never saw daylight again. The little packet had settled on the bottom in such a way that to this day it has been impossible for divers to get at the chests. And "way up and down the Suwannee River" they will tell you that what one poet said about the ocean goes for Old Man River too:"Roll on, thou deep and dark blue ocean, roll!Ten thousand fleets sweep over thee in vain;Man marks the earth with ruin—his controlStops with the shore." 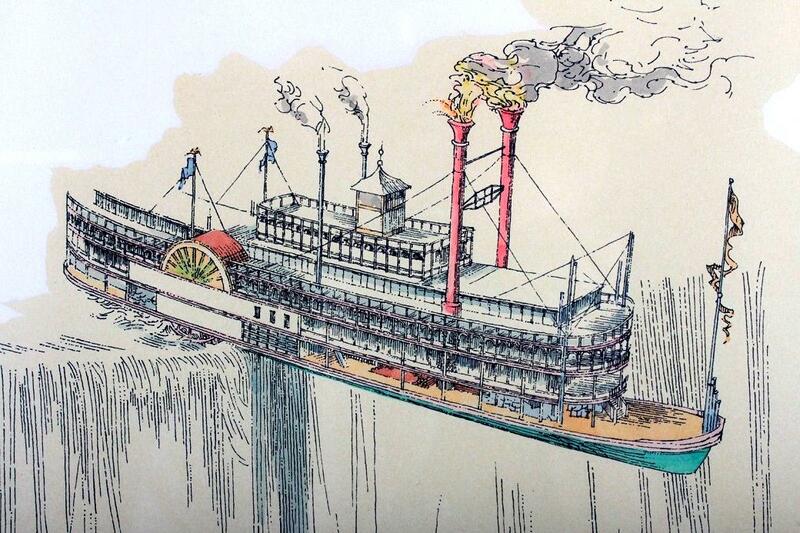 This is a detail from a color lithograph depicting a "surrealistic" concept: a big sidewheel steamboat that is about to plunge from the top of a huge waterfall on the scale of Niagara Falls. Look out below! Dimensions: 12" x 19 3/8"
Signed and dated 1967, numbered 54/56 in pencil and blind stamped at lower right Purchased directly from the artist's gallery and housed in a prominent New York corporate modern and contemporary art collection, which was recently divested by a NY auction house. annexgalleries.com William Richard Crutchfield was born in Indianopolis, Indiana on January 21, 1932. Crutchfield studied at Herron School of Art, Indiana University in Indianapolis, receiving his Bachelors in Fine Art. He later received his Masters in Fine Art in 1960 at Tulane University in Louisiana. Artist Crutchfield may have been inspired by the steamboats in the old American Bird's Eye view lithographs of rivertowns. The high angle perspective and even the style of the drawing is reminiscent of those views, so this could go on a Bird's Eye page. The lithograph is also listed on "Chairish" for the same price etc. as eBay so I've changed the caption to reflect that and have also attached a file of the piece matted and framed. To the caption is added a biography of Crutchfield from the Annex Galleries site. 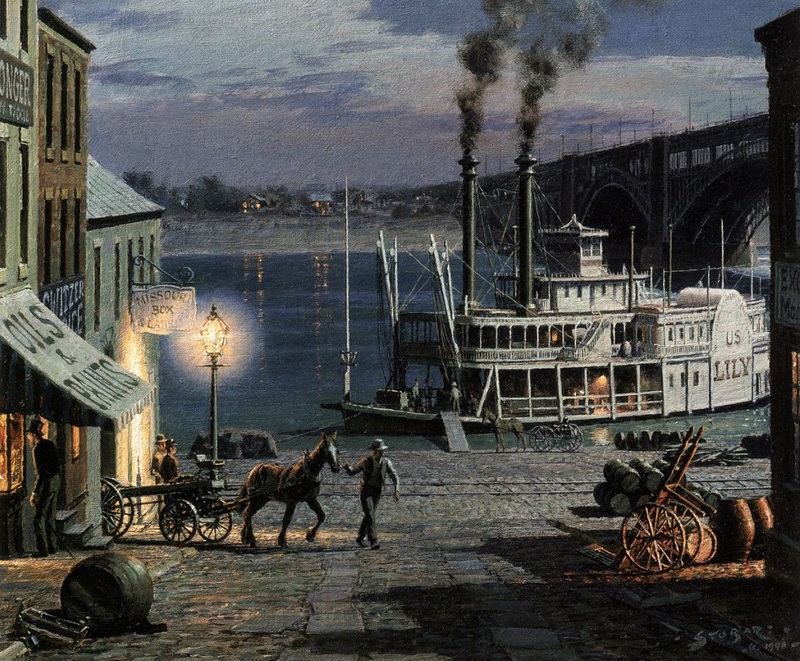 Andy Thomas painted Huck and Jim on their raft with 2 steamboats on a moonlit stretch of the Mississippi. For a 2015 issue of TRUE WEST Andy painted a climactic scene during the sinking of the SHEPHERDESS in 1844. Attached is a composite with a smaller file of the full painting in vertical format and a larger file in horizontal format of a detail of the painting. Passenger Robert Bullock found the hero within him. I show the moment the boat hit the second snag and tossed Robert Bullock and others into the Mississippi River. The second snag caused the boat to momentarily list severely to its larboard side. 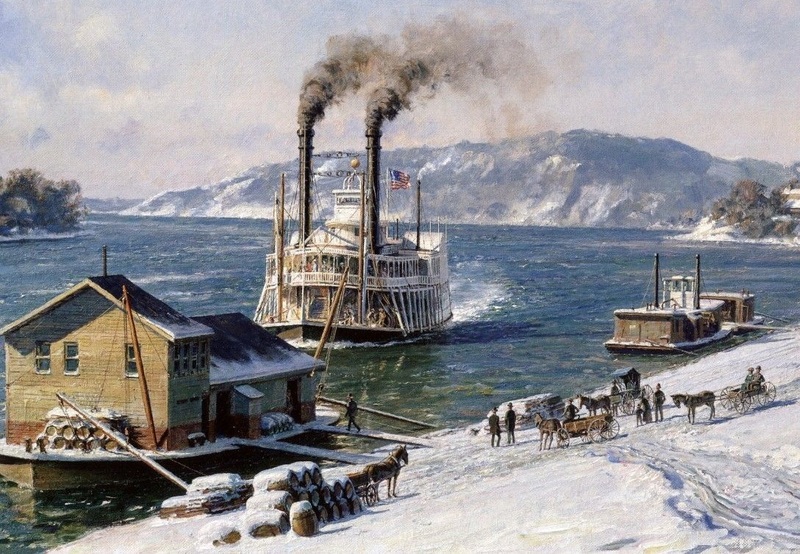 The steamboat is modeled after artist Gary Lucy's painting of the recovered steamboat Arabia; it was of similar tonnage and close to the same time period as the Shepherdess (a contemporaneous newspaper engraving depicted the Shepherdessas a sidewheeler). Author Terry A. Del Bene is a former Bureau of Land Management archaeologist and the author of Donner Party Cookbook and the novel 'Dem Bon'z. The American West begins in St. Louis, Missouri. Many entering the frontier started their journeys by riding on steamboats to jumping-off areas in Missouri. Riverboat disasters were all too frequent. On the frigid night of January 3, 1844, the Shepherdess was steaming upstream roughly three miles from St. Louis, its destination. 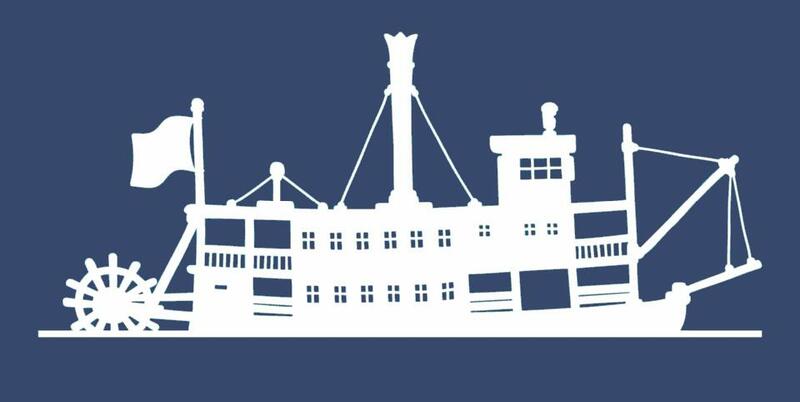 Steamboats of the period had private accommodations for those able to pay, while general passengers were provided separate women's and gentlemen's cabins. Most of the roughly 70 passengers shared these two parlors on the first deck. By 11:00 p.m. many of the ladies and gents had retired for bed. In the men's parlor, a few gentlemen sat around a stove for warmth. The air was filled with the sounds now familiar to the passengers—chugging of the engines, churning of water, water slapping against the bow, creaking of timbers, people coughing and the noises of livestock on the deck. The peaceful night was suddenly rent by a loud scraping and the sounds of cracking timbers. The boat had hit a snag of timber in the river. After a brief pause, the air resounded with alarms, screaming children and the moaning of the stricken vessel as it broke into splinters. The boat lurched and filled with freezing water, which reached the lower deck in less than two minutes. Captain Abram P. Howell entered the ladies' cabin and assured them they were safe. Afterwards, he was washed overboard while ringing an alarm bell. Three minutes after the crash, the boat was flooding to the upper decks, and the passengers were scrambling for safety by any available means. Passenger Robert Bullock, of Maysville, Kentucky, immediately responded to the crash by going from stateroom to stateroom, looking for women and children to evacuate. He took his fellow passengers to the hurricane roof, which, by this time, was the only part of the Shepherdess above water. With many of the women in their night clothing, the samaritan surrendered his fine wool coat to one lady during his several rescue missions. Included among those he rescued was Col. Joseph H. Wood's "Ohio Fat Girl," an entertainer in a traveling "freak show." The eight-year-old girl weighed roughly 250 pounds. When the Shepherdess, by this time powerless and drifting downriver, hit a second snag, the impact threw Bullock overboard. He swam the dark, freezing currents and found footing on the Illinois side. There, Bullock found two women who had been landed by a skiff, but were freezing. As the ladies drifted off to sleep, he feared that slumber would bring death to them, so he struggled to keep the suffering women awake. He helped the pair get to safety at Cahokia Bend. Forty persons, including Capt. Howell and one of his 11 children, reportedly perished in the accident. Only the efforts of unsung heroes, like Bullock, kept the death toll from being higher. The sunken ship put all of those who went into the water into a serious survival situation. After swimming to land, Robert Bullock found himself keeping two ladies alive while awaiting rescue. The nature of 19th-century clothing helped, as everyone was likely wearing woolens. Even when wet, such clothes retain some of their insulating properties. Bullock waking his fellow castaways once on land might have been prudent. If they were hypothermic, keeping them active was good; otherwise, it could have had negative effects. His best option was to keep the survivors huddled together to share body heat. 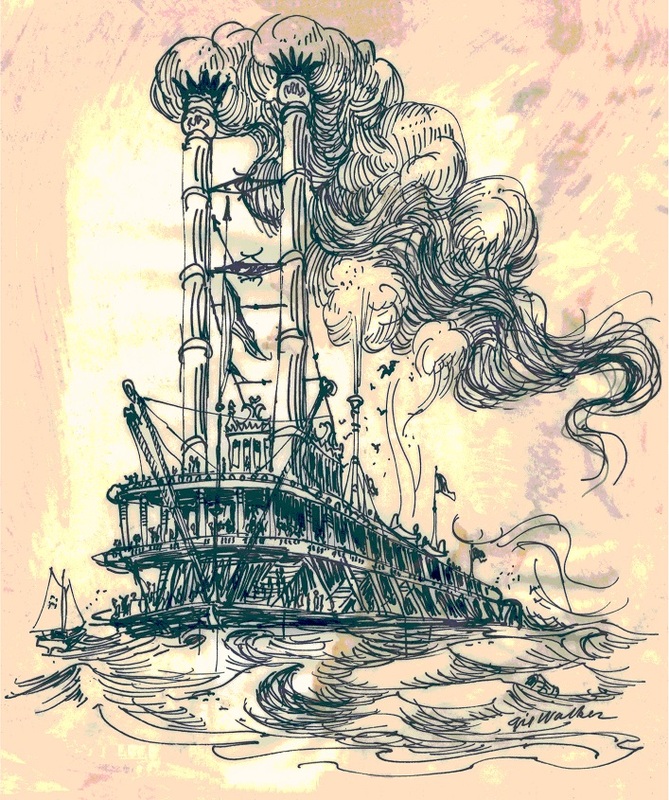 Scan of an original pen and ink drawing acquired recently of a fanciful steamboat with exceedingly tall stacks that are emitting stylized smoke reminiscent of a fairy tale maiden's luxurious tresses. This scan has been posterized and the texture of the vellum paper that was used make it look like abstract art. Drawn on vellum 5.50 x 6.30 inches & signed by Gil Walker (who is listed as Gilbert M. Walker on askART.com as having been born in 1927 and still an active artist in New York, known for his work in the historical genre. The Japanese attack on an American military installation began simultaneously with the attack on Pearl Harbor in Hawaii. Footnote: "In the engagement of December 11, the Wake Island shore batteries sank one Japanese destroyer and badly damaged several other warships. Thirty miles southwest of the atoll, the Grumman fighters sank a second destroyer. It was the last time in the Pacific War that coast defense guns repelled an amphibious landing." Wake Island is 2,300 nautical miles southwest of Hawaii in the Pacific Ocean. Original Pen and Ink Drawing with Boats from a St. Louis bakery/coffee shop place mat. Attached original pen and ink sketch that was the second picture in triptych of St. Louis history on a place mat for Teutenberg's Bakery & Coffee Shop at 10012 Manchester in St. Louis. 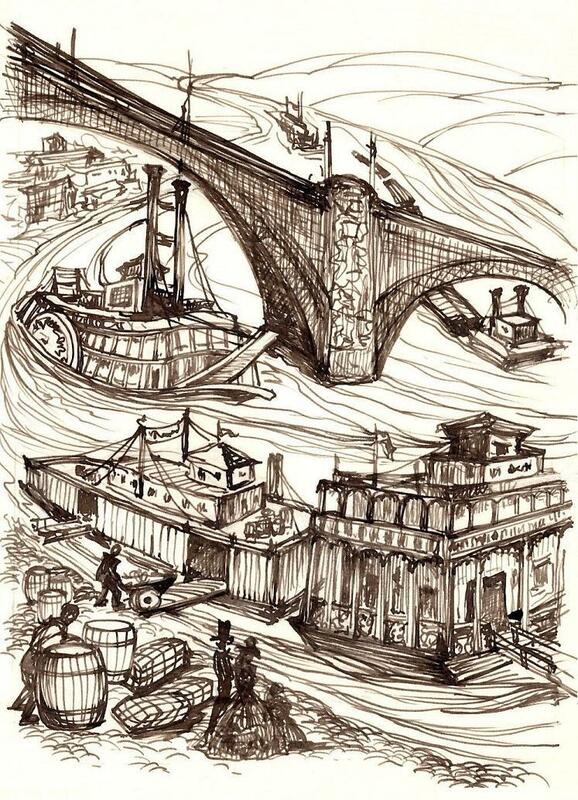 This sketch could have been either conceptual art for one of the murals in the Manchester restaurant or a sketch based on the mural of the Eads Bridge and boats that could be glimpsed in a tiny detail of a photo that was taken there. Boats here are cartoonized. Under the bridge are a sidewheel packet boat a towboat that's pushing barges. In the foreground are a wharf boat and a showboat possibly meant to represent the GOLDENROD that was at Laclede's Landing for many years then was moved to St. Charles for a while and finally was retired to a desolate location on the Illinois River where it was permitted to deteriorate until it was beyond restoration and in due course it has probably been dismantled by now. 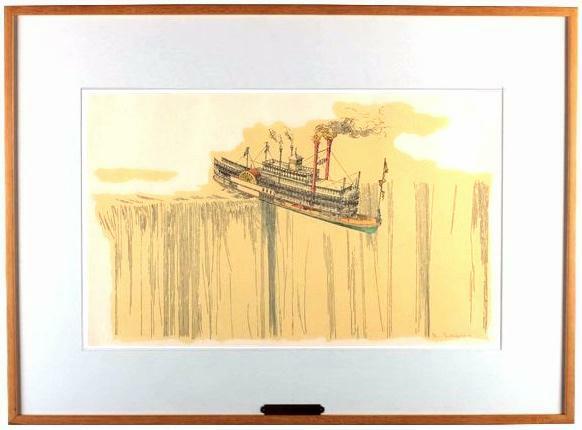 Paddle Steamer Mark Twain by Richard Hayley Lever "Art is nothing but having a good time." Here is a wonderful painting by Hayley Lever just discovered on wahooart.com during a Google search . . . 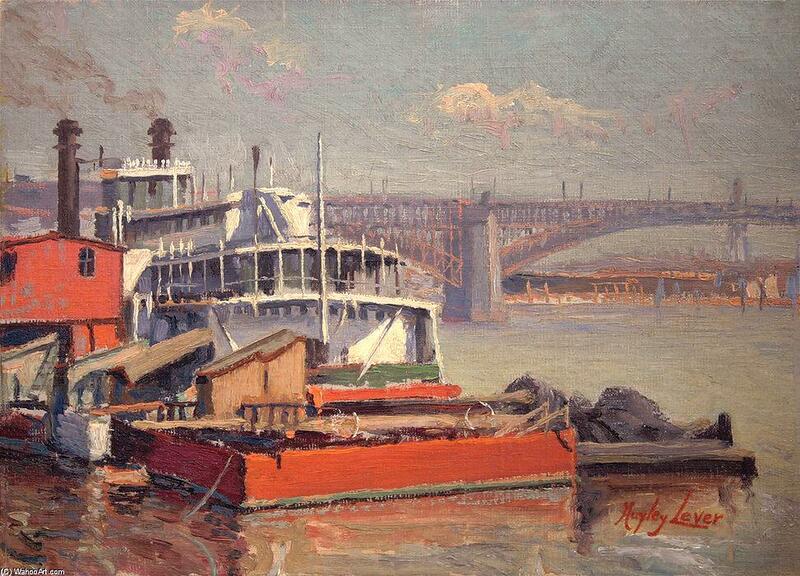 Lever loved maritime subjects and painted boats and ships in seaports and rivers in many locales here and abroad. "Art is the re-creation of mood in line, form and color. If I were confined to my own back yard for the rest of my life, I'd still have more pictures in my mind than I would have time to paint. Art is nothing but having a good time." DIXIE 4. River steamboat - Loading cotton by night. Scanned from an original "Magic Lantern" glass slide that appears to have been hand tinted. A huge sidewheel steamboat looms against the night sky complete with full moon at a landing. On the far left, the bottom of the sidewheel can be glimpsed below the paddle box and in the foreground on the left, flames; sparks and smoke from a wood fire illuminates the crew of roustabouts who are at work on the landing. 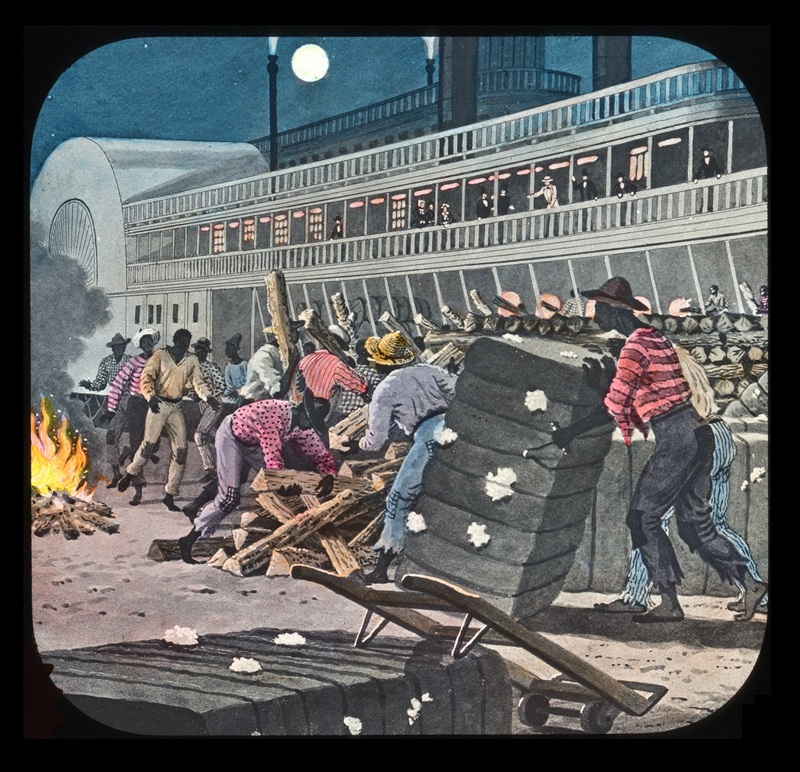 Five of them carry firewood to load aboard the steamboat while five more men approach to assist them. Another pair of roustabouts wrestle a cotton bale in the foreground. Apparently Optician McAllister manufactured Magic Lantern slides as a sideline from his primary specialty of making lenses for eye glasses. Nassau Street is in the Financial District of New York City. It is located near Pace University and City Hall. It starts at Wall Street and runs north to Spruce Street at the foot of the Brooklyn Bridge, located one block east of Broadway and east of Park Row, in the borough of Manhattan. Nassau Street was originally called Kip Street — after an early Dutch settler family — but was subsequently named in honor of the royal family of the Netherlands, the House of Orange-Nassau. It was named some time before William of Nassau, the Dutch prince who became King William III of England, so that is not the origin of the name, despite how easily it could be mistaken as such. Nassau Street once housed many of the city's newspapers. Detail from beautiful night time imagining of the U.S. LILY at Lacede's Landing on the Mississippi at St. Louis. St. Louis's riverfront near the foot of Lucas Street. Laclede's Landing was all that remained of the original French village, built around the trading post founded in 1763 by Pierre Laclede Liguests and Auguste Chouteau. U.S lighthouse tender LILY at the river's edge in 1885, behind the LILY is a portion of the Eads Bridge, built in 1874 by engineer James B. Eads who designed the three spans to stand on stone pillars that are submerged in bed rock far below the bottom of the river. The Eads Bridge still withstands the strongest currents of the Mississippi during high water. BELLE AMOUR being loaded with cotton bales by the diffused light of a full moon hanging high above in a misty night sky , at Bayou Sara, Louisiana. One of Stobart's most atmospheric paintings. The little town of Bayou Sara was wiped out by the devastating Mississippi River flood of 1927, today there is a ferry landing where the village stood. 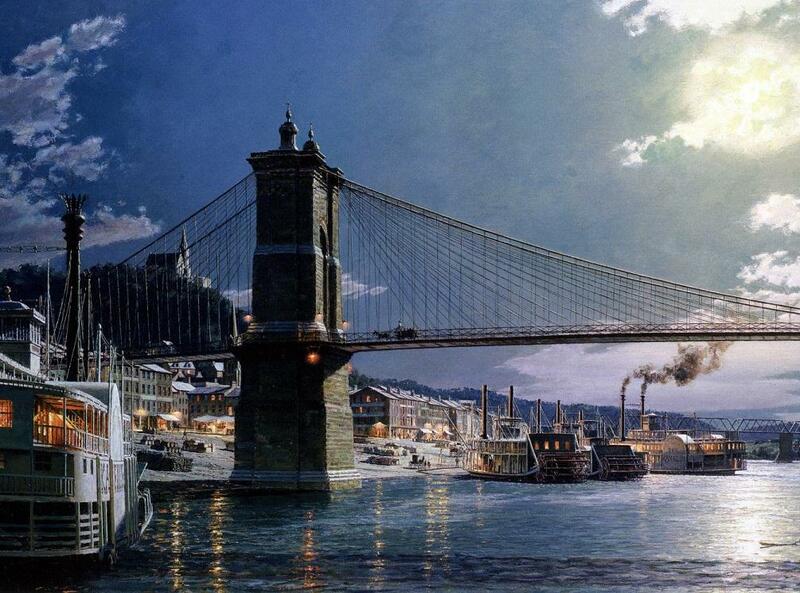 "Cincinnati, Ohio on the Ohio River : The Public Landing by Moonlight in 1884"
The packet KATE ADAMS is in the foreground on the far left. Construction on the Roebling Suspension Bridge was begun in 1856 but suspended during of the Civil War as a precaution to prevent a possible invasion of the city by the Confederate army if they crossed the bridge from the Kentucky side of the Ohio River had it been completed. When the bridge was finished in 1867 it became celebrated as the longest in the world. It was designed to carry the relatively lightweight horse drawn traffic of the 19th century so the bridge's span was narrower at the outset than it is today. With the advent of heavy motorized vehicles the bridge was reinforced with heavy girders. Marietta, Ohio's levee from Ohio Street as the U.S. Mail Packet COURIER arrives following an early snow fall. 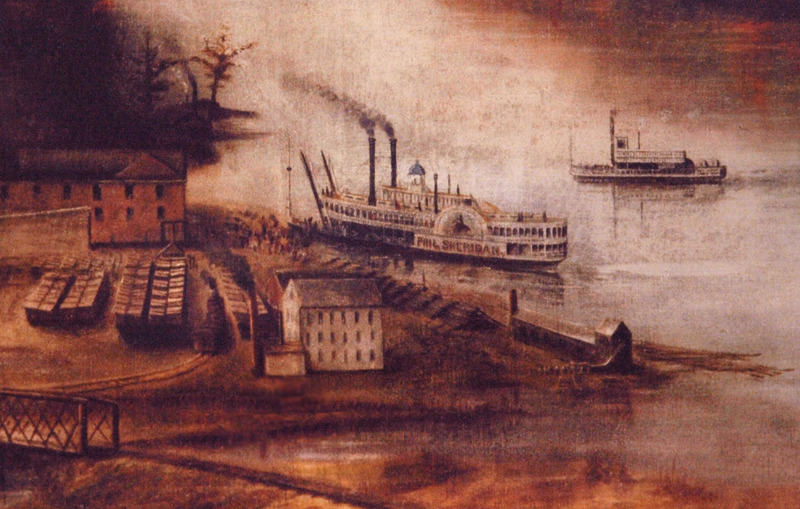 In the years following the Revolution America's Inland Waterwars formed the essential transportation routes and because of its location, at the confluence of the Muskingum and Ohio rivers, Marietta became the logical center of transportation for the interior of the Ohio Territory. 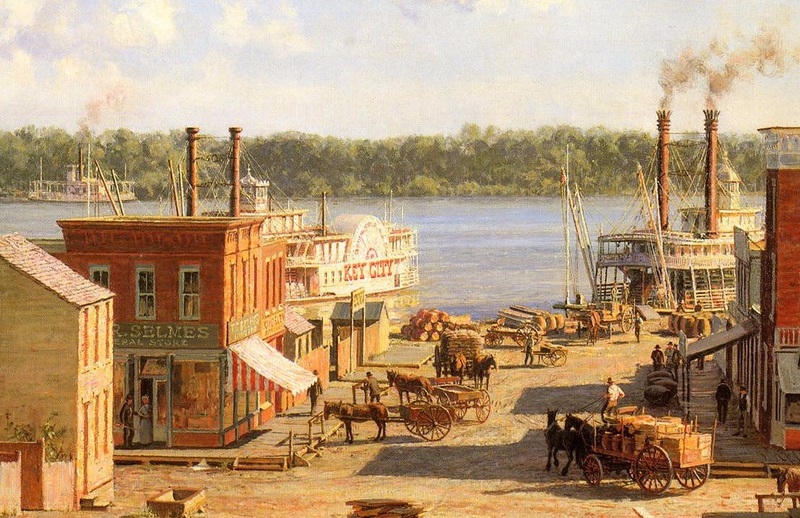 Detail from John Stobart's painting of HANNIBAL, MO with the steamboat KEY CITY (1857-1869) In the distance far left cross the river a steam ferry shuttled passengers and wagons back and forth from Hannibal and Illinois. The distinctive octagonal pilot house aboard the steamboat on the right suggests that Stobart probably intended it to be the PHIL SHERIDAN (1865-1876). 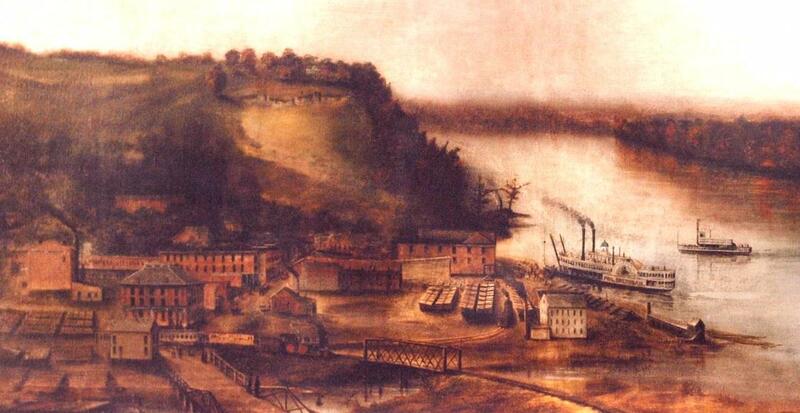 In 1869 artist and photographer George Crosby (1833-1877) painted a panoramic view of Hannibal from the vantage point of the bluffs south of town looking north towards Holliday's Hill (Sam Clemens renamed Holliday's Hill "Cardiff Hill" in TOM SAWYER) and in the attached detail the SHERIDAN can be seen at the landing beyond the pork packing complex a short distance up river from the mouth of Bear Creek. A ferry can be seen to the right of the SHERIDAN. The KEY CITY was a twin to the ITASCA so their parts were interchangeable. She ran Galena-Dunleith-St. Paul and according to one source, was the first boat through Lake Pepin. In a collision with the sternwheel packet BEN COURSIN at the mouth of the Black River, near La Crosse, Wisconsin, August 24, 1857, the COURSIN sank with the loss of seven lives. The KEY CITY arrived at Madison, Indiana for dismantling on December 6, 1869. The boat was designed for the Wheeling-Cincinnati trade under the command of Capt. Charles Muhleman, with Capt. Amos Davis and Capt. Phil Anshutz, pilots; Chris Young and Charles Knox presided in the clerk's office and James Hall was the engineer. In this week's Old Boat Column image, the sidewheeler has just arrived (January 1866) at Wheeling on its maiden trip. The new steamboat's arrival was particularly noteworthy, inasmuch as it was named for a famous Civil War general. The Sheridan proved to be a very fast boat, a quality which made a steamboat popular. The boat made its trial trip in the Cincinnati harbor on January 20, 1866. "SHERIDAN PASSED TELEGRAPH NO. 3 UNDER WAY FAIR AND SQUARE." The Telegraph No. 3 was a fast boat, having set a record between Louisville and Cincinnati on April 13, 1853. The record stood until the CITY OF LOUISVILLE broke it on April 19, 1894. The widespread reports of the Sheridan's excellent speed performance undoubtedly caused Capt. P.S. Davidson of the Upper Mississippi River to come aboard with an attractive offer for the boat. Capt. Muhleman agreed to sell the vessel upon its return to Cincinnati from one more round trip to Wheeling. It was on this trip that the Sheridan encountered a severe wind storm at Straight Creek, below Dover, Ky; the twin smokestacks were blown down, with other damage to the upper works. The boat immediately returned to Cincinnati for repairs costing $1,500. A week later, the vessel was delivered to the Davidson Line, and the steamer Potomac took the Sheridan's place in the Wheeling and Cincinnati trade. In 1876, while the Sheridan was hauled out on the La Crosse marine ways for repairs, the cradles gave way and the boat sank. The condition of the vessel was such that salvage was impossible. The steamboat was dismantled and the machinery was placed aboard the Belle of Minnetonka. Later, the engines were shipped to Alaska and used aboard the Yukon River packet Susie. For questions or suggestions regarding the Old Boat Column, Keith Norrington may be contacted by e-mail at curatorkeith@yahoo.com, or by mail through the Howard Steamboat Museum at P.O. Box 606, Jeffersonville, Ind. 47131-0606.